This is one of the projects I'm working on now. The South Gate is the fourth of my gate models. I haven't given up on the Mayor's Tower model. I'm just getting both of those models to a point where I can start putting textures on both of them -- that is, after the test assembly and the instructions booklets are complete, and all the pages are set up in Photoshop waiting for textures. Love this. Not short of gate houses, but I think this one could be better than all of them. Any chance you could include 2 panels to fit into the openings? That way it can be a gate or a complete building? No, at this point it'd take too much work to redesign that section to make that an option. I've already finished my assembly test and have moved on to the instructions booklet. 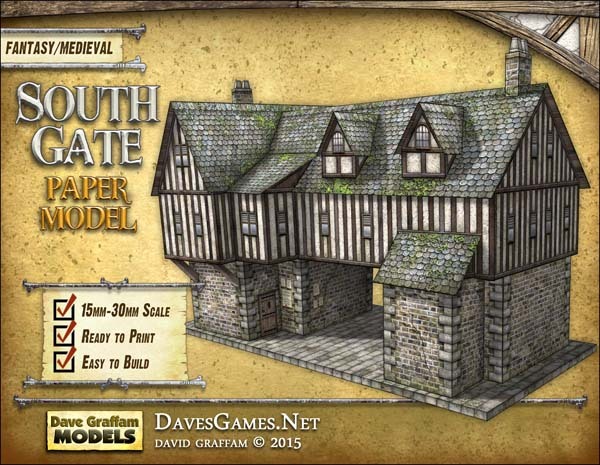 Get yourselves over to www.drivethrurpg.com/browse/pub/2985/Dave-Graffam-Models guys!! Awesome stuff as ever good sir. That gate looks fantastic. Think I'll be swapping out my West Gate for this beaut. The South Gate is now available! Dave, is the brickwork on this the same as on the Rake's Corner walls? I'm thinking that combined with those walls and the livestock shelter this would make an amazing coaching inn. Gosh, why haven't I made a coaching inn yet? Yes, I think the brickwork is similar to the Rake's Corner Walls, but the colors may not match perfectly. It's been so long since I made that kit that I just don't know for sure. My texturing is constantly evolving, so I think you'd probably notice some differences even if the basic texture was the same. A courtyard through the arch, with a stables, and we're rolling. By all means, list away.